KAJANG, SELANGOR, 17 September 2014 – The Sime Darby Foundation (YSD) may give the National University of Malaysia (UKM) research grants for studies into Learner Diversity, a field specialising the teaching of the young with special needs. 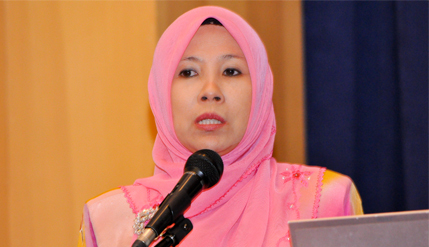 YSD Chief Executive Officer Hajah Yatela Zainal Abidin said the foundation is willing to fund research into Learner Diversity to assist children from disadvantaged families although it is something new to the foundation. Delivering her keynote address at the opening of a two-day International Learner Diversity Conference (ICELD) 2014 organised by UKM’s Faculty of Education here today, she said YSD is already committed to several UKM programmes. YSD had granted funds to UKM’s zero-waste programme through a RM15 million endowment UKM-YSD Chair for sustainable development and the UKM-YSD Chair for Climate Change worth RM5 million. YSD also provides scholarships to three students from China, four from Liberia and many more from Indonesia to study at UKM. Opening the conference, Deputy Vice-Chancellor (Research and Innovation) Prof Dato’ Dr Mazlin Mokhtar sought for the grants because UKM is the only university in the country so far to do research on learner diversity. “Why not provide a million or two or even RM500,000 for learner diversity so that we can look further into the needs of special learners,” he said. Prof Mazlin had also sought for an additional RM1 million for a special centre for learner diversity to be a one-stop data centre for researchers while meeting the needs of special learners. The centre will also enable the staff to keep in touch with the underprivileged and marginalised learners in the first few years of the education that they deserve. He said research into learner diversity is not just research for research’s sake but to meet the needs of the underprivileged and the marginalised who needed to be looked after as Malaysia is committed to becoming an inclusive society where no one is left out. Among the types of special learners the Faculty of Education are studying are slow-learners, those with autism and the handicapped. Present at the conference were Chairperson of the conference Associate Prof Dr Manisah Mohd Ali and Education Faculty Dean Dr Lilia Halim. ICELD 2014 is the fourth in the series of learner diversity conferences which have become the platform for critical discussions on issues concerning education, governance and technology.